Shannon from ‘SIMPLE moms’ was just introduced to prAna first hand. She told me about the quality, comfort and style of the line and I had to check it out. 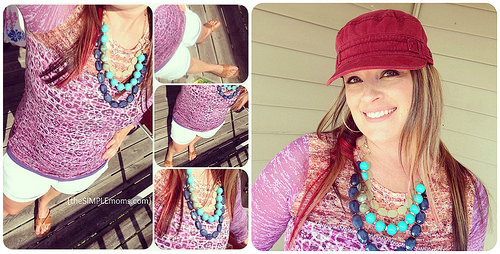 Take a look at some of the outfits she put together. So fun! 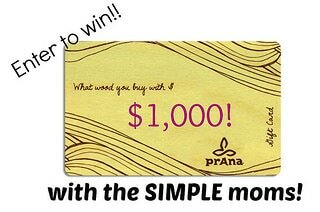 Check out Shannon’s site for more prAna looks and enter to win a $1,000 gift card to shop for yourself. I put the entry form below to make it easier for you to enter from my blog as well. I would really like to hear what you think of prAna. Have you purchased anything from them before or is it new to you too? Leave me a comment below! Good luck, I’d sure love it if one of my awesome readers won! Previous Post: « August 10th 9PM EST – #teenchoiceswag Twitter Party With @theboodlebox PLUS A GIVEAWAY RIGHT NOW! I love the Eliza jacket in coal, first thing on my wish list. Visited the site and I really like the Daphne skirt, its such a nice style. I also love the Coco dress. I love the dresses, especially the Nanette dress. So cute and looks really comfortable. I think I’m in love with the Holly dress. I also like the June yoga tote, my bag just broke. So many nice things to choose from! I love their Sephra Jacket. I love the Coraline skirt! Lots of cool things here I would love to get! I love the Julz Hoodie Top. I like the Lined Boyfriend Jeans in black! I like the look of the cuffed ends showing the lined flannel! Right now, I’m going through a dress phase and I love the cece dress. I love the maison leggings. Love the Angelica sweater – looks great for fall. Great sytles and website! can’t wait to win & shop for grandkids! The belle hat is adorable! I love the Juliana Sweater in Dusty Teal. I love the Kaley Tunic! http://www.prana.com/kaley-tunic-top.html?color=sailbluebali I have lots of Prana. I love their brand! I love the Meadow Top! I’d love a pair of their Maison Knickers! The Maison Leggings rock and I would love to have them! I love the Julz Burnout Wrap! Perfect for transitioning to fall… Thanks for the chance to win! I LOVE the Julz Burnout Wrap!!! I really like the Bhakti Weekender Bag.